Irish Mob ’13 courtesy of Turning Point. The spotlight never dims, even when the Irish are in the midst of their darkest performances. The vultures, the critics scratch and claw their own mundane path to relevancy at the expense of Notre Dame’s famed football program. And that program that is so rich in tradition, so vibrant in story, so expectant in opportunity, never falters. They never waver. Because they will always restock their shelves. At the end of every season, elite talent is chosen from a very select pool of educated, articulate, and esteemed high school athletes. There’s no secret to having a stout recruiting season. You win, they come. Plain and simple. But for close to a quarter century, Notre Dame has not won. They have not produced. They’ve been hyped by every media outlet before every season, only to underperform and disappoint. And the world loves it. In fact, I had the pleasure of “discussing” Notre Dame’s irrelevancy before this season began with a fan of a team who has won half a championship since the 1940’s. Little did he know, the Irish would go on to an undefeated regular season (including a win under the lights against his beloved Wolverines), a national championship birth … and a top 3 recruiting class. But, with Notre Dame, they’ve always come. The tradition, the gold helmets, the magical campus has always attracted talent. So, what’s so different about this 2013 class? These recruits get it. They fight, and claw, and bleed for each other … and they haven’t even played a down of football on Kelly’s grass. 3-star linebacker commit, Mike Deeb understands the importance of camaraderie at this level. He understands that championships don’t come with mere talent, but with talent doused in compatibility and character. Everyone knows that the Irish have always recruited well. But that ability hasn’t always equated to wins. However, the brotherhood that was formed on February 6th, 2013 (National Signing Day) is changing the culture at Notre Dame. If taken onto the field, it will be near impossible to stop. It’s that outlook that knits a team together. And not just for one year of relevance either … but several. Anyone who thinks the Irish had a fluke season can join my Michigan buddy at the dinner table to enjoy a nice meal of fried crow. And eat as much as you can, too, because the Irish are back; and they’re going to be cleaning the table and sweeping the floor for many years to come. The major media outlets all agreed that Notre Dame recruited a top 3 class this year … the talent is there once again. But more importantly, the camaraderie is back, and it’s walking hand-in-hand with Notre Dame’s relevancy. Kumbaya, my friends … kumbaya. ND Nation is excited, too, John. And the entire world will be watching … waiting for you to fall once more. America loves to see the good guys take a knock to the chin. They love seeing champions relent. 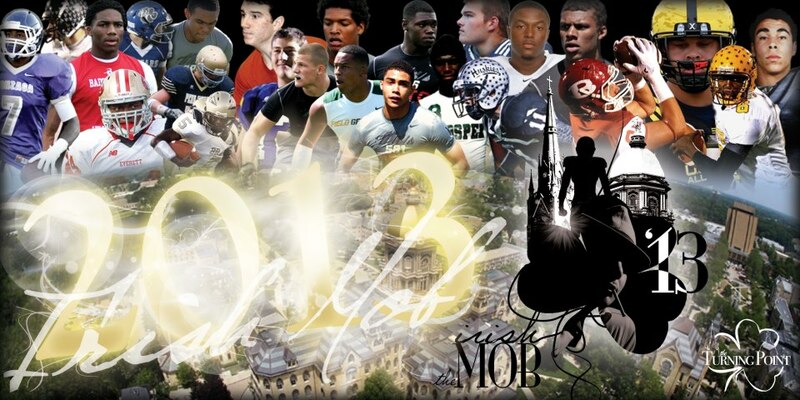 Congratulations to the incoming freshmen who are about to extend the vibrant history of Notre Dame football.